Discover How To Create Successful Real Estate Postcards. Discover How To Create Successful Real Estate Postcard Marketing. Your Proven "3 Step" Real Estate Postcard Marketing Solution is Here. You get leads, listings, and make more sales with Real Estate Postcards. You don't have to lift a finger and it's very affordable. Our real estate postcard marketing service is "turn-key". 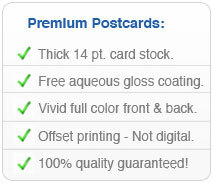 We design, print, address, and mail out your postcards! You’re going to love the results, see how it works below. All our real estate postcard designs are top-producers. Developed with the help of some of the most successful brokers in the country. Every design utilizes direct response marketing techniques. The whole idea is to get your prospects to remember your name and most importantly pick up the phone and call you now. Choose from prospecting postcards, just listed postcards, just sold postcards, and holiday postcards. Get Started on Your Postcard Design Now. You quickly fill out a short form, upload your images and we'll design your postcard within 48 hours for your approval. 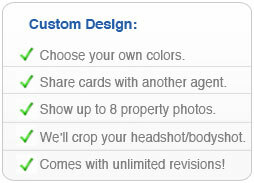 Your postcard order comes with unlimited design revisions. We can match colors with your logo, trim a couple pounds off your photo or put your face on your favorite super hero and we won't charge a dime extra! Your design is 100% satisfaction guaranteed or your money back. Your postcards will get you recognized, respected and recommended. According to a NAR Research poll, 57% of sellers and 41% of buyers ranked reputation as the most important factor when selecting an agent. Knowing this, we went to work creating real estate postcards that build your name & reputation, so when it's time to make a real estate deal they'll think of YOU first. Simply enter one "center" address and our system will create a list of every homeowner in a radius of that "center" address in the quantity you chose. You'll also receive a copy of your mailing list for your review and postage statements from the postmaster. You save time and money with in-house mailing service. Avoiding shipping costs, remove the hassle of stamps and labels, while getting the lowest postage rates available. *Yes, real estate postcards with no mail service are available. *Unsolicited leads that call YOU first. That's what makes real estate postcard leads so great. They are unsolicited. Your FSBO, newspaper and online leads are getting bombarded by hundreds of agents everyday. Those leads are shopping for the lowest rate, and your competition will drop their commission below what is acceptable. It's an endless cycle of price discounts!When you market with real estate postcards, leads call you. They are exclusive, meaning other agents are out of the loop. That gives YOU bargaining position. You'll start signing exclusive listing agreements because you're well-known, liked, and trusted, NOT because you are the cheapest Realtor in town! Want Tips? Read 5 Marketing Mistakes That Agents Make Here. postcards, printed on glossy 14 pt. UV stock that they won't forget your name. Don't take our word for it Get FREE Real Estate Postcard Samples Now..
Give a deadline for your prospective seller's home to be featured on your next big just listed postcards campaign and they'll sign faster. Less Thinking. More Signing. you to spend less time working dead leads and more time showing and giving listing presentations.